Site updates, plot events, and promotions will periodically be posted here. Both rules and plot information are located here, including forum rules, mechanics, and character types. A collection of official and player-submitted lore pages. Site-wide contests meant to encourage member contribution to the site's meta. Anyone is welcome to enter, and all entries, even if they don't "win", will receive a prize! Submit character applications for approval. Note that the actual character application is your user profile page. See Personal Details on your in character account. Any extra information you wish to post about your character, including plot trackers, timelines, plotters, and character diaries. Find roleplay partners, members to play your wanteds, and develop plots. Remote communications between characters, such as phone calls, emails, text messages, and D-Terminal instant messages. A small island in the middle of the vast Digital Ocean. Native Forest covers a large swathe of File Island and is one of the safer areas, largely populated by Child Digimon and only the occasional Adult. File City is the island's main urban center, featuring towering skyscrapers, delicious restaurants, and even seedy bars. In the heart of Native Forest lies Primary Village, a kind of hatching ground for Digitama that are cared for my Digimon guardians. Mount Panorama lies in the middle of File Island, its high peaks impossible to miss from any vantage point. The mountain's valley is a wide savanna frequented by traders and caravans, and beyond the valley is a trio of cities: the infamous(ly smelly) Trash Mountain, throne to King Sukamon; Factorial City with its booming industry and factories; and Toy Town, a small, strange population of misfits. 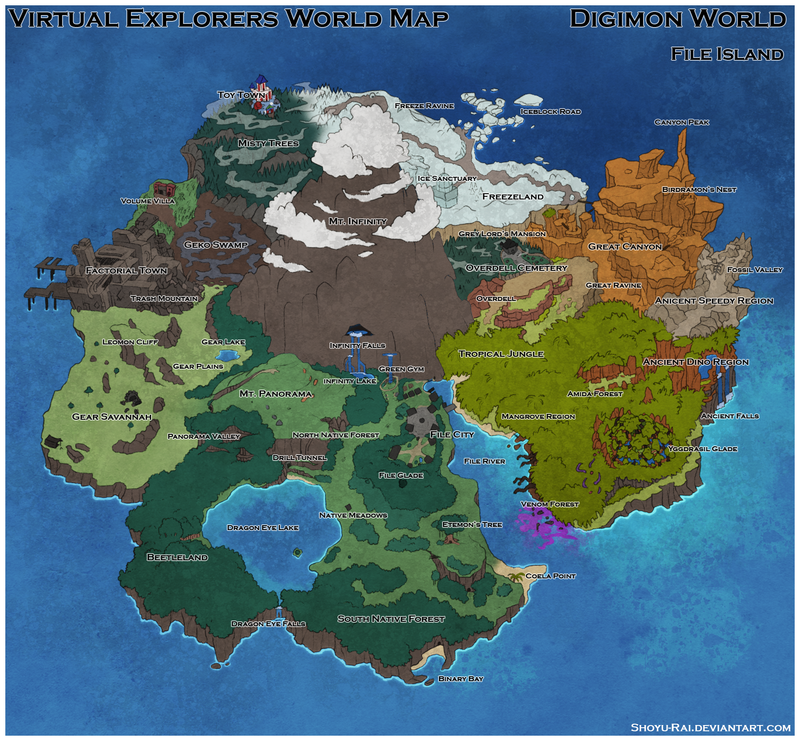 East of the Forest Region is a veritable wasteland, sparsely populated even by feral Digimon. An ominous fortress sits in in the west part of the wasteland, previously abandoned but now apparently home to a mysterious group. The wasteland eventually gives way to steep, red canyons and Neon City, nestled between steeps rock faces. The southern tip of File Island is cold and unforgiving, and the Digimon who name the Arctic Region home are similar. Other than the tribal, violent Digimon, the Ice Sanctuary is also haven to a group of religious and scholarly Digimon who study Ice Sanctuary and the origins of the Digital World. Ads can be bumped or reposted as long as the last ad is no longer on the first page. Ads that are excessively reposted or bumped in a single month will be deleted. We do not accept ads from sites that require guest accounts or do not allow ads from Xenforo or 3-3-3 sites. Episode 1 Event 1 Genesis? On the Island of Adventure!